Let the 2009-2010 ski season beging...almost. 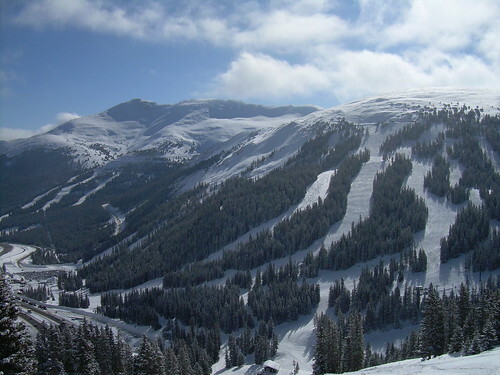 Loveland Ski Area in Colorado is set to open for the season October 7. It's Loveland's earliest opening in 40 years. So for all those who want to get in those first runs, the time has arrived to beat the morning mountain traffic, sharpen the skis and dust the boots in the closet. Credit has to be given to Chris Anthony--skier, adventurer, Vail-er, Warren Miller movie film star (at least in my book as I flipped out when Anthony sat down next to my husband and I at Two Elk Lodge in Vail a few years back)--for this news that totally brightens the gloom that looms outside my window. October in Chicago can be nice in some people's books with the leaves changing, the cooler but not frigid temps, and sunlight that hasn't disappeared into winter hibernation yet--but not mine. So when skiing news flies across my eyes, I'm all for it, and admittedly always look forward to that October announcement of which Colorado resort, Loveland or Arapahoe Basin, will win the battle of the resorts. Colorado has seen snow falling from the sky, in the mountains at least, since September, and reportedly was even dumping a bit on October 1. Even The Huffington Post was reporting the Loveland and A-Basin were already cranking up the snow-making machines just after the turn to fall. But Loveland won the battle with folks set to line up at 9 a.m., October 7; and A-Basin isn't quite ready to open up shop. And to make the news even better, other Colorado resort openings are just around the corner. Keystone is next to open for the season on November 6, with Breckenridge on its tails on November 12.